We have finished our in-depth review of residence halls at the fifty universities in our group, and below is a list of the universities whose honors housing received the highest scores. First, let us say that there are differing opinions as to what attributes an honors hall should have. Indeed, some notable and elite public universities such as UCLA, Illinois, and Wisconsin do not, to our knowledge, specifically designate honors residences on their campuses, confident either that their student bodies as a whole are scholarly or that it does not serve elite students well to have their elite status reinforced. In addition, some universities take the view that fully separate honors housing is not the best arrangement; many universities designate honors floors in residence halls that include non-honors students or allow non-honors students to commingle even more freely with honors students in living/learning centers or regular dorms so that honors students have more contact with the study body as a whole. 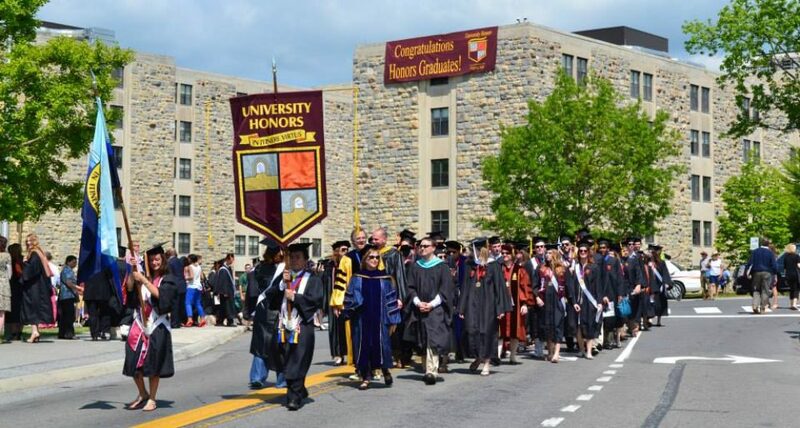 Then there are honors programs, and, especially, some honors colleges, that have self-contained honors communities that are limited only to honors students, maintain their own dining halls, and offer the nicest amenities to residents of the college. These institutions typically invest heavily in their honors facilities, often with funds from large, private endowments. We take no position on the relative merits of these arrangements, but our evaluation of honors residence halls does consider some characteristics that are in fact more typical of the newer or recently renovated facilities with better amenities. For example, we assign points for bathrooms that are not shared by entire floors but only by suite residents. We also assign points for dining halls that are located within or adjacent to honors dorms. The location of the honors residences in relation to classrooms, dining halls, student unions, etc., is a very important factor. We also give credit for honors housing that is available across the entire four years of undergraduate work, and for special amenities such as in-room sinks, free use of laundry equipment, fitness centers in the halls, and for refrigerators that are supplied by the university. After some debate, we have decided that even though many college students value the enhanced sociability of traditional dorms with corridor bathrooms, and care relatively little for some of the other amenities listed above, many honor students would prefer quieter and, yes, nicer residence halls that have a strong academic orientation. Please bear in mind that no evaluation or ranking of residence halls should be the sole or major reason for choosing an honors program or college. A personal visit to the university that includes a tour of residence halls is by far the best way to make an informed choice. This entry was posted in Honors Residence Halls and tagged Best Honors Residence Halls, Top Dorms by Honorsadmin. Bookmark the permalink.